The Hawaiian male nobility wore feather cloaks and capes for ceremonies and battle. 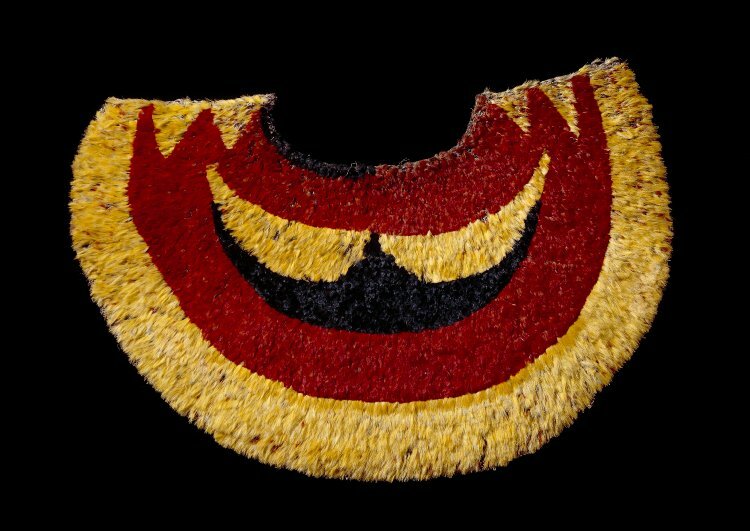 Such cloaks and capes were called ‘ahu’ula, or “red garments.” Across Polynesia the color red was associated with both gods and chiefs. In the Hawaiian Islands, however, yellow feathers became equally valuable, due to their scarcity. They consisted of olona (Touchardia latifolia) fibre netting made in straight rows, with pieces joined and cut to form the desired shape. Tiny bundles of feathers were attached to the netting in overlapping rows starting at the lower edge. The exterior of this example is covered with red feathers from the ‘i’iwi bird (Vestiaria cocchinea), yellow feathers from the ‘o’o (Moho nobilis), and black feathers also from the ‘o’o. This small cape has a shaped neckline which would closely fit the wearer. This style of semi-circular cape is considered a later development from the trapezoidal shape. Large numbers of feathered cloaks and capes were given as gifts to the sea captains and their crews who were the earliest European visitors to Hawaii. Some of these attractive items would then have passed into the hands of the wealthy patrons who financed their voyages. It is not known who brought this particular cape to England. P.H. Buck, Arts and crafts of Hawaii (Honolulu, Bishop Museum Press, 1957). S. Phelps, Art and artifacts of the Pacific (London, Hutchinson, 1976). Cite this page as: The British Museum, "Feather cape," in Smarthistory, March 1, 2017, accessed April 23, 2019, https://smarthistory.org/feather-cape/.